Its a matter of Honour. Honour, it's what you need to survive in the Walled City. It's what you display when someone gets in your way, when someone takes what's yours. 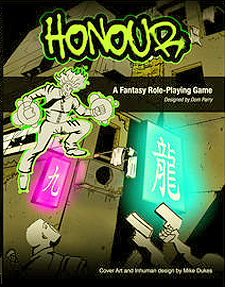 In Honour the Role-playing game players take on the roles of everyday citizens of the city of Heung Gong, in Asya the largest and most powerful continent on the world of Pangu.. A place eerily famliar, but really very different to our own world. In Heung Gong is the Walled City, a city-within-a-city, which houses gangs, thieves, murderers, drug lords and demons! In Heung Gong the characters will discover that they are not as everyday as they might have first thought they were! So enter the world of Honour, come into the city of Heung Gong and meet the Charmed Ones, create magic, battle demons and brew tea!